Following the loss of her husband to ALS, a mother struggles to raise four children alone, and discovers her eldest son and daughter suffer from mental illnesses. Following the loss of her husband to ALS, a mother struggles to raise four children alone, and discovers her eldest son and daughter suffer from mental illnesses. She describes her interactions with various public agencies; social, medical and judicial. As she cares for an alcoholic, paranoid schizophrenic son, and a daughter with personality disorder which culminates in suicide, she examines memories from her childhood in a dysfunctional family. She discovers a genetic closet with mental illness, alcoholism, and deviant behavior. Following a fourth marriage, she finds peace, but at the price of letting go of her mentally ill son. 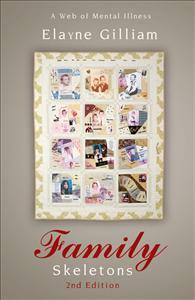 The author gives a true account of the struggles coping with tragedy in her family. She survived the loss of two husbands,the loss of her daughter by suicide from depression, and coping with her eldest child with schizophrenia.She describes surviving her childhood with a very difficult mother.See what happens in the end and how she survived!